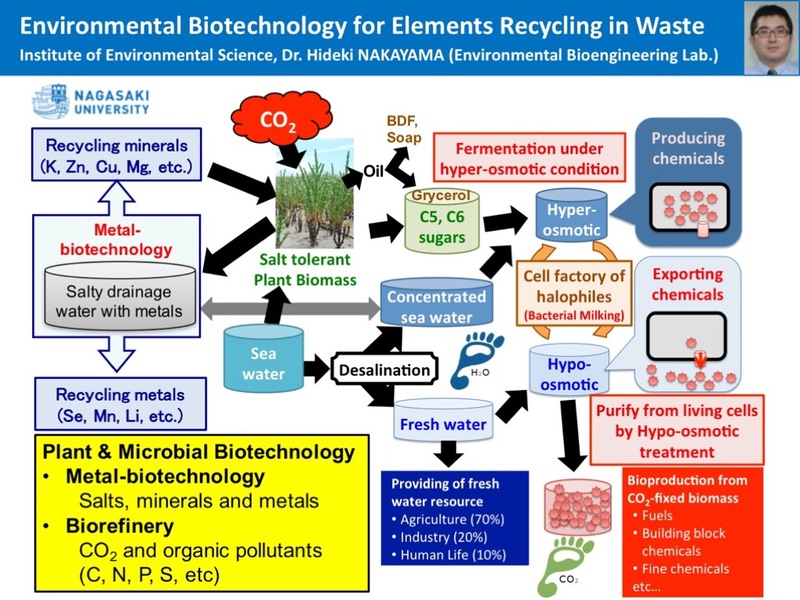 our aim is to develop novel environmental technologies involving environmental bioremediation and sustainability. High salinity and metal pollution are often observed together because inorganic metals and mineral salts are concentrated simultaneously in nature. Therefore, the key to a successful metal-bioremediation is to develop a remediation technology that can be used in high-salinity environments. Moreover, we are now facing thread of global water shortage for sustainable agriculture as well as industrial activities. Therefore, in order to save our future from the water crisis, we need to develop novel biorifinery processes using halophilic or salt-tolerant plants and microbes, which can directly use seawater rather than fresh water resource. Now we focus on elucidating molecular mechanisms underlying salt- and metal-stress responses in plants and microbes and on developing superior metal-biotechnology and biorefinery system to be used at high salinity sites.